Chennai, January 19: With Jallikattu protests reaching a feverish pitch across Tamil Nadu, leaders, both national and local, can be seen scrambling to arrive at a compromise. While Tamil Nadu Chief Minister O Panneerselvam approaches the Union government in hopes of an ease on the ban, we get a feel of the situation on the ground. PETA and many of your fellow animal rights activists claim that Jallikattu inevitably spawns torture on bulls. Could you elaborate on the pain that the animals might be forced to endure? Some other posts circulating on social media show bulls drinking a transparent liquid that some claim to be illegal alcohol. To these allegations, I’d like to point out that according to the Tamil Nadu Regulation of Jallikattu Act 2009, every bull has o undergo a medical test before and after the Jallikattu event by a government veterinarian. The medical examinations make a note of the condition of horns of the bull and its overall physical condition. The exam also takes a blood sample that checks for blood alcohol levels. The reports are then collected by the sub-collector and submitted to the government. If there was any trace of alcohol in a single bull, it would have been noted. Further, every bull that has been examined has a unique ID tattooed to its horns. 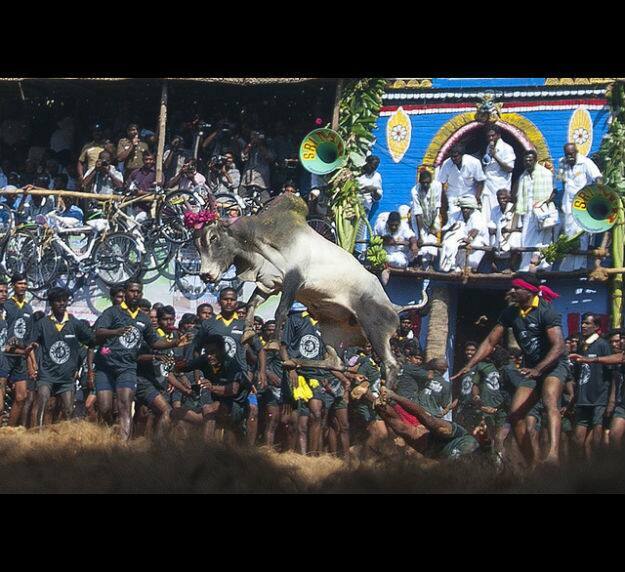 The Tamil Nadu Regulation of Jallikattu Act 2009, also necessitates that sportsmen must engage in bull taming only while wearing a standardised uniform. The pictures that are circulating have neither of these. While we acknowledge that the photos could be legitimate, they must have been taken before 2009 when the regulations were not in place. You and many others argue that Jallikattu is essential to preserve indigenous bull breeds. Aren’t there better ways to ensure their preservation? Jallikattu is often called a bloodthirsty and barbarian sport. This is because of a lack of understanding. Jallikattu is nothing but an ancient form of a cattle show. The more than 2000-year-old sport would begin in villages where the residents collectively look after a stud bull. The bull would be called a “temple bull” and would roam freely in the village without even a nose rope. It would be fed by all the villagers. The legend goes that if the bull would drink water from your house, good luck would be in store for you. The bull would then be taken to an annual cattle show where the best, strongest and most virile bulls would be identified via Jallikattu. The winning bulls would help their respective villages increase their “brand” value and their income. This is how indigenous breeds are still maintained and preserved today. A ban on Jallikattu would de-incentivise bull breeding thereby reducing them to slaughter houses. Further, the entire animal husbandry industry would have to resort to sperm banks on being deprived of healthy bulls to breed from. Do you feel that the Jallikattu ban is an insult to Tamil sentiments? Jallikattu is a part of the Tamil identity. It is a part of our culture. We already have regulations in place, we don’t see why the sport cannot be conducted. For an arid state like Tamil Nadu, Jallikattu is paramount to maintain the health and productivity of cattle. We have been conducting the sport for centuries now, banning it will definitely hurt Tamil sentiments. The Jallikattu ban has proved to be too much for us. Our youth has recognised this and is protesting to regain the respect rightfully due to us. We are peace loving people and we will protest to preserve our culture.